In order to finish the month of March on track financially, we’ve decided to limit ourselves to only $100 Argentine pesos for the next 6 days. That’s about $22.88 U.S. dollars. Needless to say, it’s not a lot of money as this city is not cheap. We’ll give you a daily update on every centavo (cent) we spend and the meals it affords us. – Lunch: Homemade biscuits and raspberry Bonne Mamam jam, the best! – Breakfast: Flour tortilla with cinnamon and sugar! Our challenge is bringing out a very kind generosity from some of our new friends. Jason, a Canadian who has hired me to help build his company website www.techsalespros.com, let us fill up our 6 liter jugs with his filtered water. That saved us about $25 pesos! 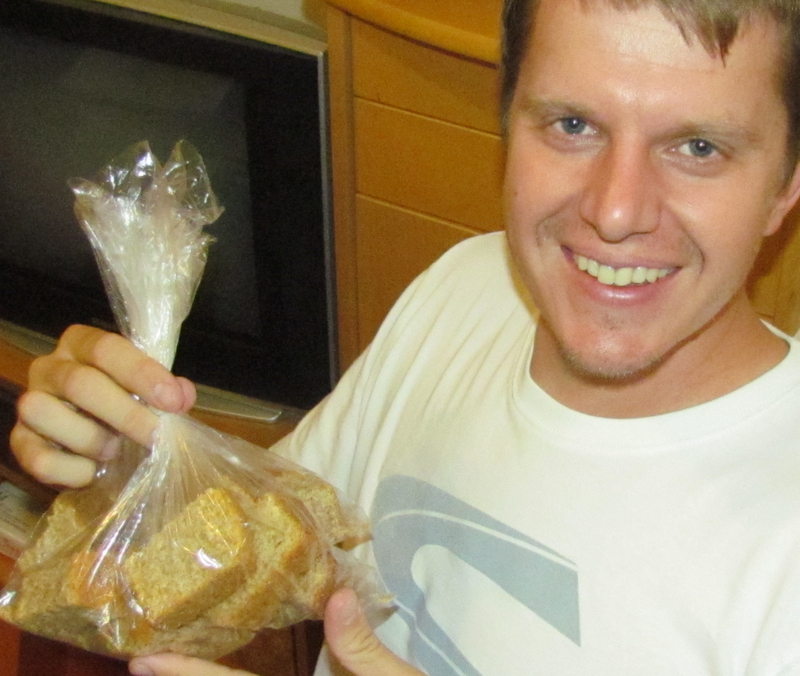 Also, Jaco, from South Africa, brought us some traditional, homemade “beskuit” (think biscotti) that his mom makes. 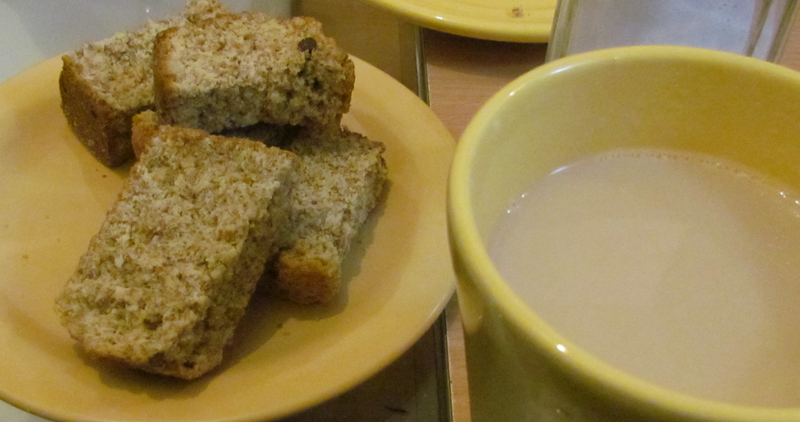 His mom’s beskuit is literally the best coffee-dipping food we’ve ever had and will keep us fed. We started Saturday, the last day of this craziness, with 85 cents and ended it way over budget. Here’s what happened. We headed out to go pick up my friend’s cousin, Daniel, who was on vacation here from Mexico. We quickly learned that the subway line we needed was closed because of the race car event that was hopefully going to be our final destination. We now had to walk across the city to Daniel’s hostel. Our path led us past the racing event, and not knowing the track layout, we thought we should cross to other side of track. Turned out that was a bad move. We got stuck inside the loop of the track and weren’t allowed to cross back over. So we waited and decided to enjoy the race. I watched in complete joy as these crazy loud and ridiculously fast cars zipped by on the street where buses and taxis usually plod along in traffic. Once we were allowed to cross the track, we were more than 2 hours late. Thankfully, Daniel was still at his hostel, so we took him back to the race track, watched the cars again, then headed out to find a place away from the crowds and noise. I led us to a generic café. After all the walking and frustrating delays of the day it was nice to just sit and relax, so I went for comfort and ordered some croissants (medialunas) and a hot chocolate. The billed turned out to be quite steep. We would have gone over budget just from the public transportation alone, but this last café pit stop at the very end sent us way over. That’s how it normally goes. If we fail to keep our budget it usually happens in the very end by some unexpected thing. Later that night we were able to save from going further over budget only by the generous donation of pasta and pasta sauce from our friends, Scott and Ashley. I think this is the first week in my life I’ve eaten food specifically donated to me. Though this was a self-imposed challenge and we have money to buy food, it’s still humbling to receive food from friends. We are so grateful that we already have friends here who support us and help us to live out our goals. We certainly hope to be the same kind of people. Even though we failed to keep our budget, we’ve learned quite a bit this week. We’ve learned about friendship, food creativity, and that we desperately need a water filter. First, just visit this website. It goes without saying the site needs a lot of work. So, Gaby and Pablo, the wonderful owners of Pancho Villa Tortillas, have agreed to barter with me. I’ll build them a new and improved website and they’ll deliver us some of their AMAZING food. If you’re in Buenos Aires and miss Mexican food, you seriously have to email them today to get your order. It’s so good! Good Luck!!!! Once your budget starts anew for April, why not invest in some sort of filter (Brita or PUR) pitcher so that you may use the water from your tap. Just a thought! Haha, I am like Mrs. Breakfast Taco over here too. My go-to food for sure. That jar up there has my mouth watering! Hope you guys are taking advantage of the prices in Barrio Chino — the produce and rice are often cheaper there. Great job and a very healthy selection of foods. I’m proud of you. I second the motion by Jill to investigate the Brita or whatever is available to you in BA. It should save you dollars in the long run. Love ya. Keep the posts coming. I’m enjoying them so much. Your healthy choices will serve you well. God provides…opens opportunities (barter, then the word spreads) and even provides the “frills” sometimes. May you find the water filter Jill suggested. My mom, Stephen, would have called you a “long drink of water” so you must keep hydrated physically and spiritually (smile). Blessings and love to you both.